It’s time to save some money and plan for your upcoming wedding! And lucky for you we’re having a back to school sale! Fall is a busy time for wedding planning and it’s never too early to get started on finding the perfect invitation, or perhaps your save the dates if you’re just starting to plan! Now through the end of September use coupon code “BACKTOSCHOOL” in our Etsy shop when placing your order and you’ll receive 10% off your full order. Looking for new, exclusive designs? We’ve got those too! Check them out! All of our designs are completely customizable. Colors and fonts can change and if there are other requests we will work with the bride and groom to make sure their ideas come to life in their invitation! You can purchase all of these invitations in our Etsy site or contact us for custom requests! 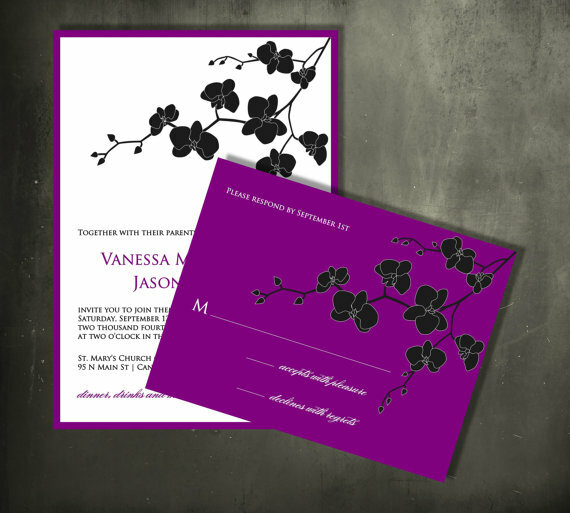 Our new Orchid Branch Invitation is simple but beautiful and it’s a great fit for any wedding! Its single accent color gives it a clean, modern look that will make all your guests jealous! 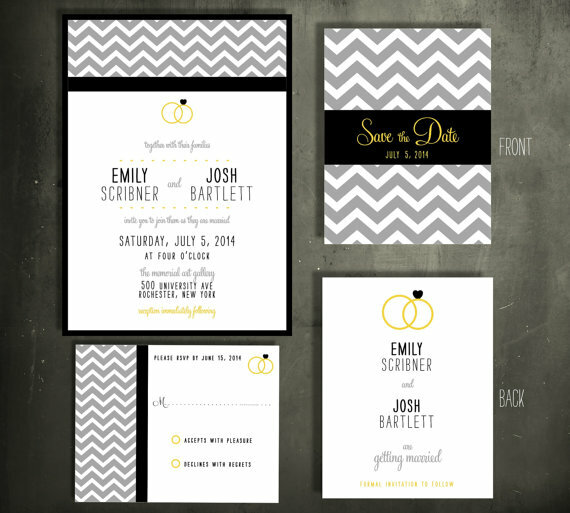 The Chevron Rings invitation suite is a unique, contemporary design with a fun, bold color scheme! Interlocking wedding rings and hearts give a romantic touch to this trendy invitation. 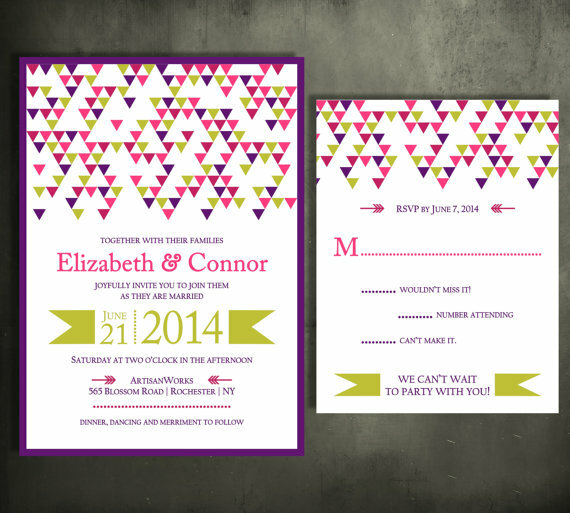 The Triangle Confetti invitation suite is a one-of-a-kind invitation. Its bursts of color and decorative pattern sets it apart from other wedding invitations. The confetti pattern gives guests the feeling of a celebration! Your guests will definitely want to showcase this invitation in their home! 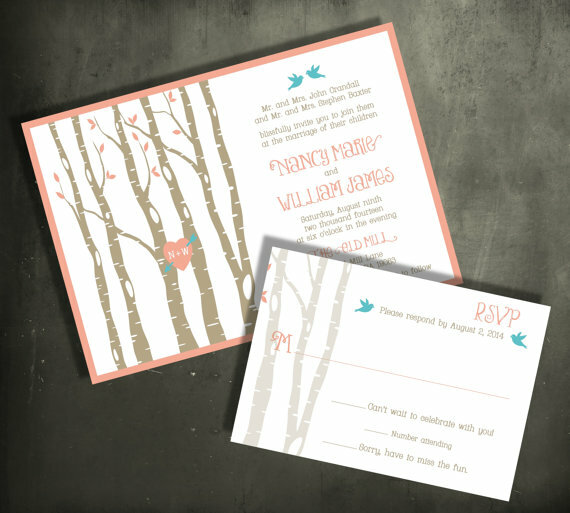 The Birch Lovebirds invitation suite is a personal favorite of mine! The coral and blue work so well to compliment each other in this particular design and it’s definitely a color scheme that guests won’t be expecting! This invitation is adorable, charming and personal, especially with its customizable heart with initials. The Ombre invitation suite is definitely a unique collection. 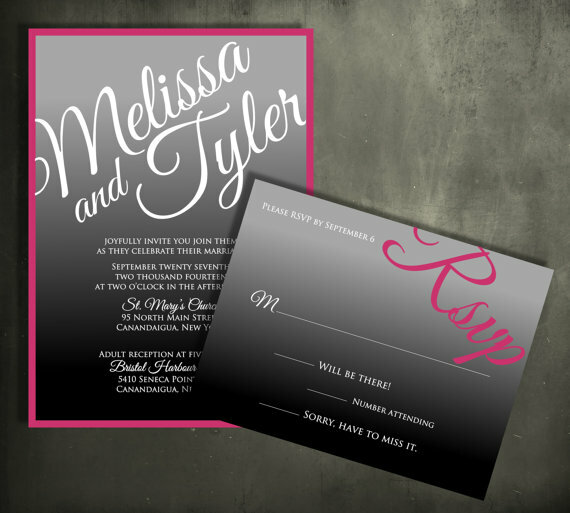 Its ombre design is fun but sophisticated and it acts as the perfect background for your invitation. The oversized, elegant script makes your and your groom’s names stand out on your big day! 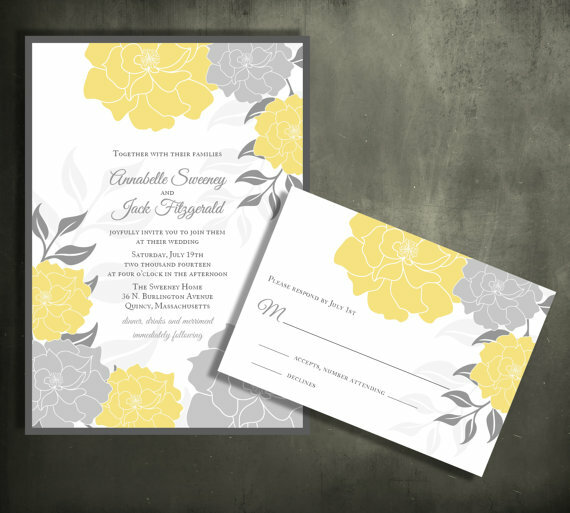 The Peony invitation suite is a beautiful floral design, which is great for any outdoor or summer wedding! These colors compliment each other perfectly and they highlight the beauty of these big, bold peonies. If you want any of these new, creative designs for your wedding visit our website or our Etsy page to purchase them or check out our other custom designs while you’re there! We will work with you to make sure your wedding stationery is perfect for your special day! So we all know the most important people on your wedding day are…the guests. There is a very good chance that at least one person will leave your wedding disappointed but there is a way to prevent this, since we know your main concern on your special day is making sure the guests are happy. And what is the answer you ask? 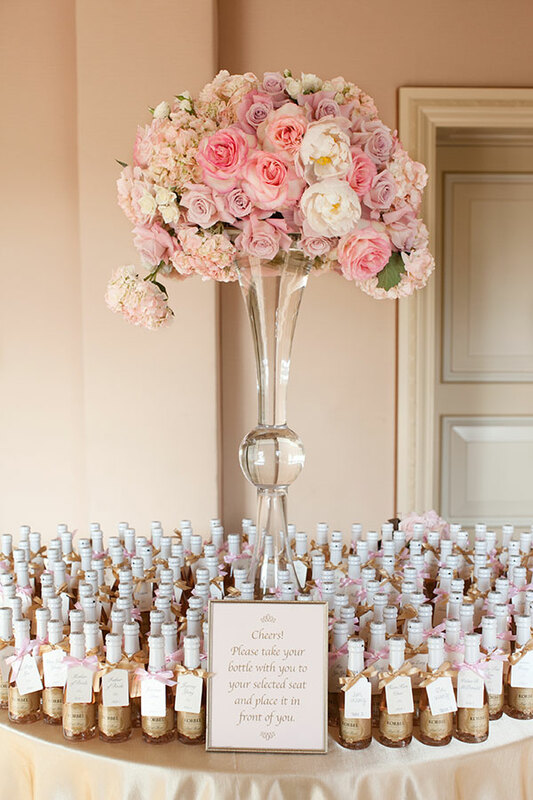 Give your guests an unforgettable favor at the end of the night to make it all worthwhile! If I’m disappointed with your wedding and having an awful time but you end the night with personal boxes of Krispy Kreme doughnuts you can expect very good reviews from me! Whoever came up with this idea, THANK YOU! And for anyone who’s reading this that might be attending my wedding in the future, you can most definitely expect Krispy Kremes for your favor! I personally suggest using these as your favor unless there’s children at your wedding, then you may want to avoid the 300+ calorie, pure sugar dessert, just saying! If you don’t feel like making your guests fat and unhealthy, well that’s your decision but don’t complain when they’re bashing your wedding to everyone they know because they didn’t get this awesome favor! But of course there are always other options, for instance, alcohol. These mini champagne bottles are too cute and they even double as a drink and a place card, all the more reason to use them as favors at your wedding! Plus, no guest will leave your wedding disappointed if you give them free alcohol as a favor, I guarantee it! There are so many unique and creative favors that will guarantee your guests leave happy; it’s all about finding the one that’s right for you! 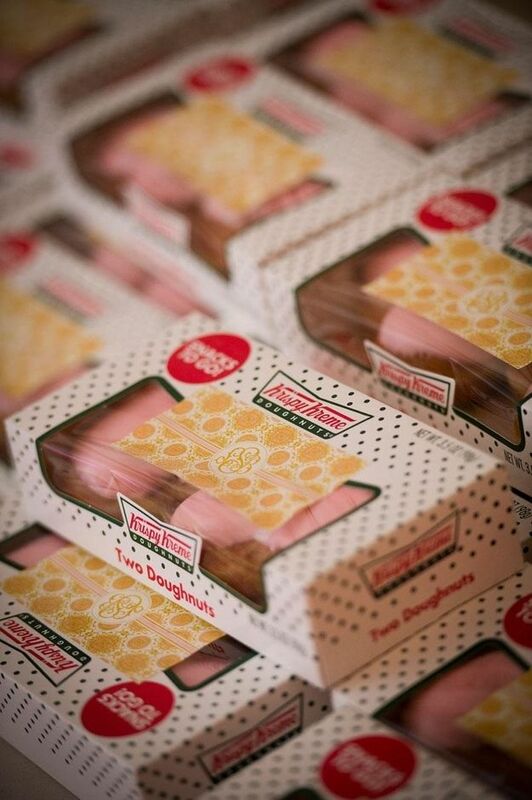 Maybe that’s a box of Krispy Kreme doughnuts, maybe not (but it should be!). For cute, creative custom invitations and decorations visit our website, Facebook or Twitter page! 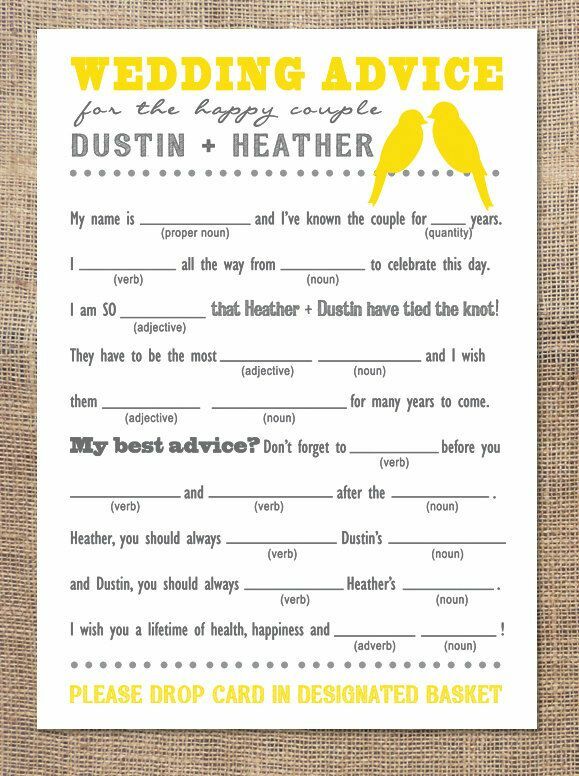 Advice cards for your special day! Every time I look at Pinterest I see more and more fun and creative new things to incorporate in a wedding but one of my recent favorites is advice cards. I’m sure no amount of advice can really prepare you for what marriage is actually like, but at the very least your guests will have something to keep them occupied until dinner is served! I’ve seen these done many different ways but these letterpress coasters are definitely one of the cutest ideas so far. And what better place to put marriage advice than under a drink? The person who came up with this idea clearly didn’t need the advice since they already knew when the couple would need it the most! 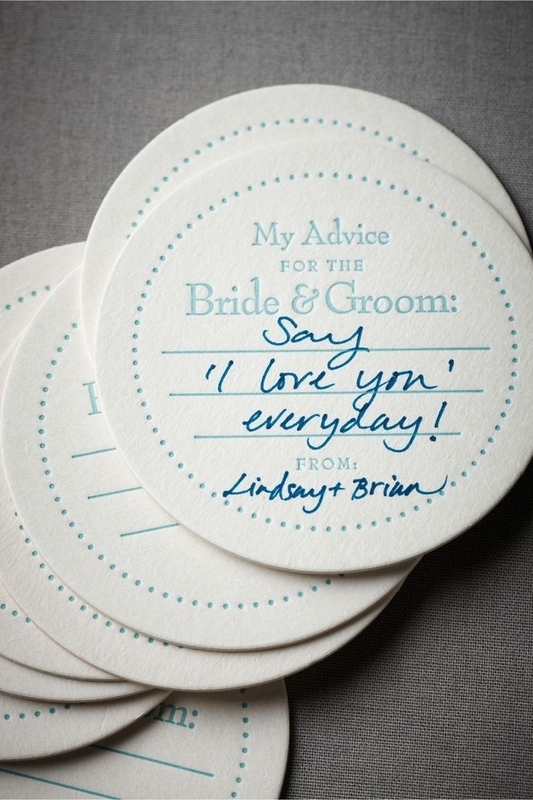 But in all seriousness, these coasters are a special and unique way for your guests to give you their best advice on your big day! If you’re interested in buying these adorable coasters you can do so here and be sure to check out the post where I found them for more wedding ideas! But before you do that take a look at these other advice cards I found. I, myself, tend to get bored at some point at every wedding, whether it’s at the actual ceremony or during that awful break between the ceremony and dinner so these advice cards are perfect for those hard-to-please guests like me! This Mad-Libs style card lets guests put a funny twist on their advice but it also tests their memory of basic English grammar which is sometimes even funnier than the advice itself! You may not get the most helpful advice but as long as your guests are creative you’ll be guaranteed a good laugh after the wedding! If you’re not scared of the things your guests might come up with you can buy these cards here or contact us at peacockprinting@gmail.com if you’d like us to make something like them customized just for you! For more things wedding you can visit our site and check out our Facebook and Twitter!